Yesterday, Capcom announced the first major expansion for Monster Hunter World, Iceborne, which will release next year on all formats. The Japanese publisher also confirmed a new cross-over event that will bring Geralt of Rivia into the world of Monster Hunter World. Earlier today, Monster Hunter World producer Ryozo Tsujimoto revealed some new details on The Witcher 3 collaboration event on the Official PlayStation Blog. The event, which will apparently be launched early next year, will introduce more RPG elements to the game. 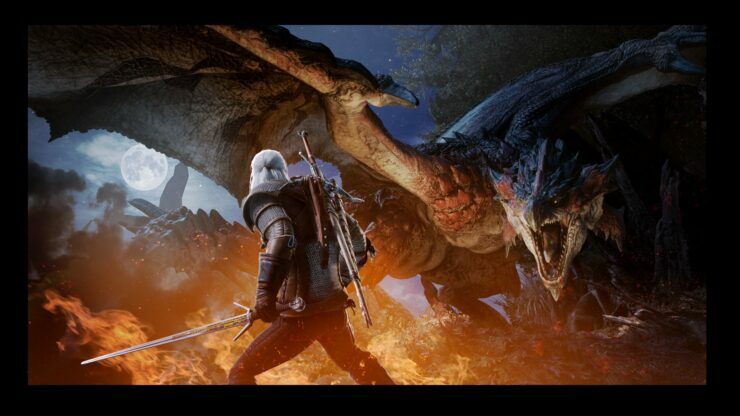 The quest for this collaboration is really unique because it mixes Monster Hunter: World gameplay along with the RPG elements of The Witcher 3: Wild Hunt to create a really fresh experience we think is going to appeal to fans of both series. You’ll see that coming early in 2019. We couldn’t have done it, of course, without the close collaboration of CD Projekt Red. We’re still working with them right now on the content and I think you’re really going to enjoy it. Ryozo Tsujimoto also spoke about the Iceborne expansion, confirming that they will introduce a new rank with the expansion as well as some new monsters. We are introducing a new quest rank, and while the content in Iceborne isn’t quite as big as the already huge Monster Hunter: World game, the expansion is sizeable and is really going to build upon the existing world. Fans familiar with the concept of the expansions that we’ve done in the past should have some idea of the scope and that we’ll work to make it as voluminous as possible. I’m sure the fans must be wondering about what new monsters they might go up against in Iceborne. Of course, there will be some brand-new monsters you’ve never seen before making their first appearance. Also, if you look very closely at the trailer we’ve released, at the very end you might just get a hint at some of your old favourites returning this time around.